If I’m going out to meet a customer, I’ll always make sure to have a local copy of the infocenter on hand in case I have to look something up. Luckily enough, there’s an easy way to do this. 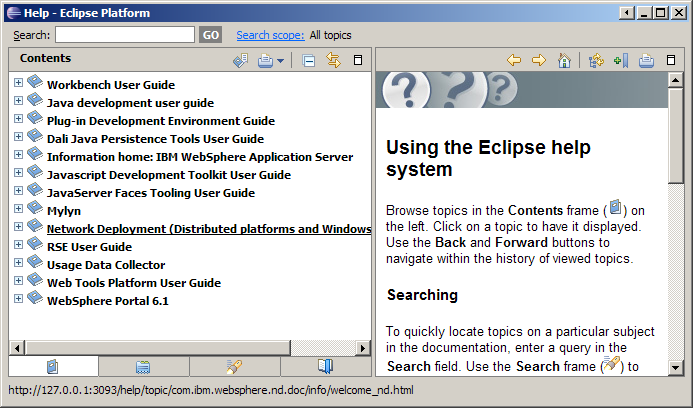 The infocenters for WebSphere Application Server and WebSphere Portal are available in Eclipse Help System form, which is pretty much the same way they are presented over the web. You can download the infocenter in Eclipse Help System format from this page for WAS and this page for Portal. If you don’t have Eclipse already, download it from here. Any one of the versions should do. 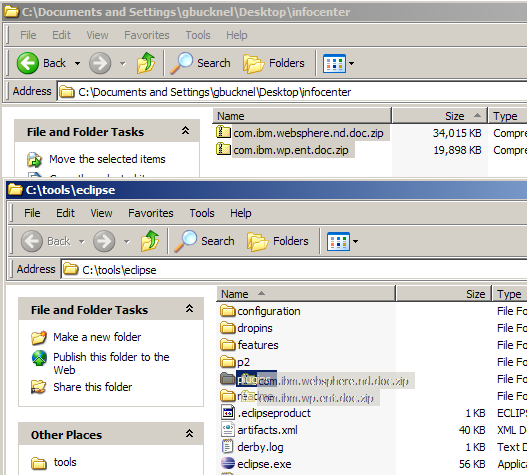 Unzip Eclipse and then copy the infocenter zips into the eclipse/plugins directory. Then unzip the infocenter zips in the plugins directory. Now start Eclipse, and pick any old workspace. Click Help -> Help Contents, and the Infocenter zips that you copied in should be along side any other help files that come with Eclipse originally. Now you have a local copy, make sure to update it since the infocenter is updated monthly. This entry was posted in howto and tagged eclipse, infocenter, WebSphere Application Server, WebSphere Portal. Bookmark the permalink. surprised you don’t offer a script to do this in a crontab. who wants to do this manually every month or so ?! Hmm, good point. Sounds like a plan. It’s worth noting too that after you install the info center you probably want to run one search of the info center to rebuild the index. That way when you need to use it it’ll be indexed and nice and fast for searching.